Balancing the increased pressure to improve productivity and quality, while reducing cost against mandated safety regulations is one of the most complex challenges in industry today. 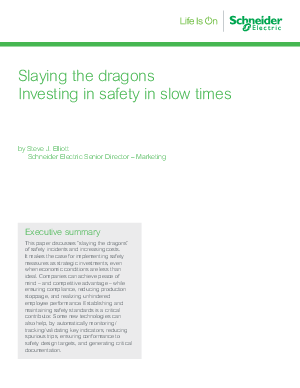 There are measurable benefits to implementating safety measures as strategic investments, even when economic conditions are less than ideal. Companies can achieve peace of mind – and competitive advantage – while ensuring compliance, reducing production stoppage, and realizing unhindered employee performance. Establishing and maintaining safety standards is a critical contributor. Some new technologies can also help, by automatically monitoring, tracking and validating key indicators, reducing spurious trips, ensuring conformance to safety design targets, and generating critical documentation.